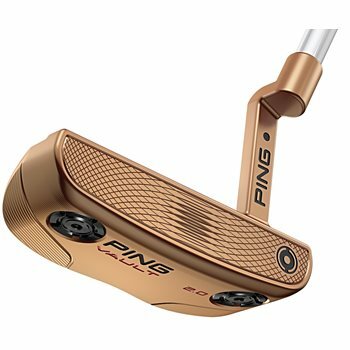 The Ping Vault 2.0 putters are the next generation of Ping’s 100%-milled putters. Crafted and engineered to provide tour-caliber touch and performance, the Vault 2.0 putters use patented True Roll Technology and a new custom-weighting system. The new custom-weighting system offers sole weight options in steel (standard-weight head), tungsten (15 gms heavier than standard) and aluminum (15 gms lighter than standard) to match the feel and balance you need for more consistency on the green. Off-center hits are sped up by individually milled True-Roll face patterns, ultimately leading to fewer three-putts. The heads are engineered to exacting standards and fully machined to the tightest tolerances to ensure premium quality and precision in look, feel and sound. The B60 model is optimal for players with a slight arc putting stroke.